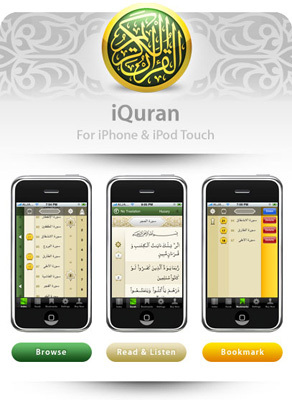 The new iQuran 3 for iPhone and iPod Touch. Image courtesy of Guided Ways Technologies. How do you treat your iPhone when it contains the iQuran? Your house is on fire. In one room is your copy of the Quran; in another, your iPhone. You only have time to rescue one of them. Which will it be? Thanks to a recent fatwa, this dilemma can be avoided. Your copy of the Quran can reside on your iPhone. In March, Islamic scholars in Abu Dhabi ruled that Muslims in the United Arab Emirates may store and read Quranic passages on their smartphones and other mobile devices. But the existence of virtual sacred texts presents other perplexing dilemmas about the application of traditional rules for proper reverential handling, use, and disposal. Can one take the Quran-loaded mobile device into a bathroom, an “impure” place in which the analog analog is forbidden? And is there any place more impure than the interior of one’s iPhone, where the bytes of the digital surahs can commingle with Lady Gaga’s or Nancy Arjam’s bits on video? I began this series by contemplating Julian Huxley's stirring dream of a future in which the “universal culture” of science would unite the sundered human tribes; where collective international pursuit of the scientific enterprise—“by its nature opposed to dogmatic orthodoxies and to the claims of authority”—would hasten the reign of reason. One intrusion of reality into Huxley's dream, as I have noted in the course of this series, is a strain of “reactionary modernism” in which the trappings of modern science and technology are appropriated by conservative movements in the service of anti-modern, inegalitarian values. The story of the smartphone fatwa presents another. Here the force of modern science is pushing people in the direction of change, not because they adopt the intellectual outlook of critical rationalism but because in practice they embrace the use of technological products in the hurly-burly of their everyday lives. According to the coverage by the Abu Dhabi-based journal The National, the smartphone fatwa—issued, like other GAIAE rulings, in response to a questioner whose identity was not revealed—quoted the Quranic surah Al-Muzzammil (“the Mantled One,” or “One Folded in Garments”), “Read you, therefore, of the Quran as much as may be easy for you” and reasoned that believers are to read the text “using whatever means possible, for that is better than not reading at all” and that they will be “rewarded greatly for doing so.” The ruling also noted that “gadgets that make searches easy” could be used for religious betterment. Cell phone are on the side of belt and at times like on airport etc we cannot leave cellphone outside so it goes with us in the rest room. With Sharia is it going to be [disrespectful] to Quran to have it on iphone or other smart phone when some times it goes to restroom or if I take my daughter in my lap sometimes her feet touches the cell phone even though it is un-intentional? So long as the [Quran] application is not open, there would be no problem with having the phone under the belt, etc. . . . so long as the application is not opened, it would not be wrong to do so, more so if you have no other choice. Best to have the phone fully covered when entering the restroom, merely out of respect. . . . [Out] of sheer respect for the fact that the application is present, even though not opened, do give the ‘iphone’ its due care and respect. Not unlike Surah Al-Muzzammil, which excuses from intensive scripture reading those who are “in ill-health,” “travelling through the land,” or “fighting in God’s Cause,” this suggestion is nothing if not pragmatic. Still, it is not without theological implications—and at least two incompatible implications at that. When does a mobile device count as a Quran? Whenever it stores the right set of metaphysical and moral truths, a body of information the essence of which can be retained even in binary bytes? If so, then believers may be required to give their iPhone 4s ritual burials when the next upgrade arrives. Or is a mobile device a Quran—literally, “the Recitation”—only when it is instantiating this information in the right human-decipherable language, or perhaps only when it is generating the sacred auditory object itself? If so, then it may follow that even a paper version is sacred only when a believer is engaged in recitation with it. What must make Steve Jobs smile down on us from his brushed-stainless-steel perch is that the future of such theological questions is slipping from the hands of traditional scholars and government authorities and into the pockets of individual believers as they adapt their religious attitudes and practices to new habits of lived experience in a technologically-enhanced world. As the professor of religion and culture Rachel Wagner and others have been documenting, new communication technologies are challenging traditional models of authority in Muslim communities throughout the world, especially by enabling easy access to formerly obscure foundational documents by laypersons, most of whom are not Arabic-speaking. The very technologies that the General Authority of Islamic Affairs & Endowments endorsed may make it less likely to be consulted at all the next time. 1. Ibn Warraq, ed., Which Koran? Variants, manuscripts, linguistics (Amherst: Prometheus Books, 2009). 2. Richard Martin, Mark Woodward, and Dwi Atmaja, Defenders of reason in Islam: Mu’tazilism from medieval school to modern symbol (Oxford: Oneworld, 1997). Austin Dacey, Ph.D., is former director of Science and the Public, a program of the Center for Inquiry and State University of New York at Buffalo, and author of several articles and books, including The Secular Conscience . He holds a doctorate in applied ethics and social philosophy and has taught most recently at Polytechnic Institute of New York University.